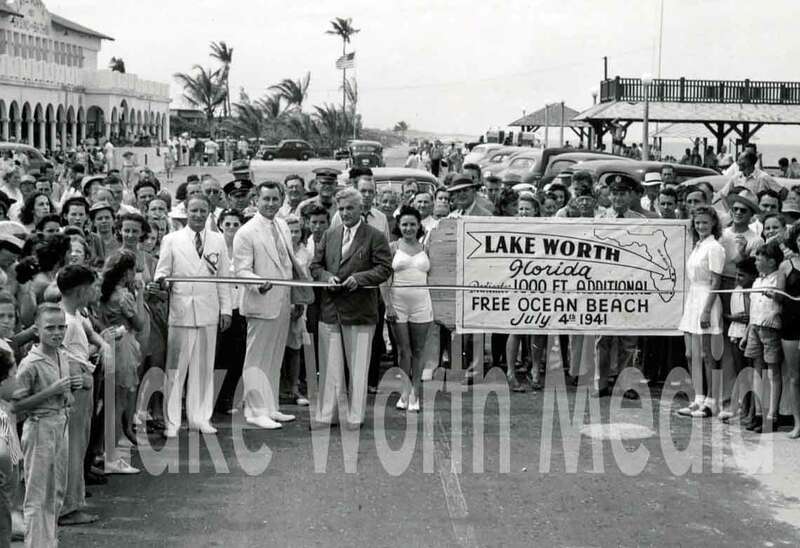 These photos appear courtesy of Lake Worth Museum and William Coakley. Unauthorized reproduction or distribution is prohibited. 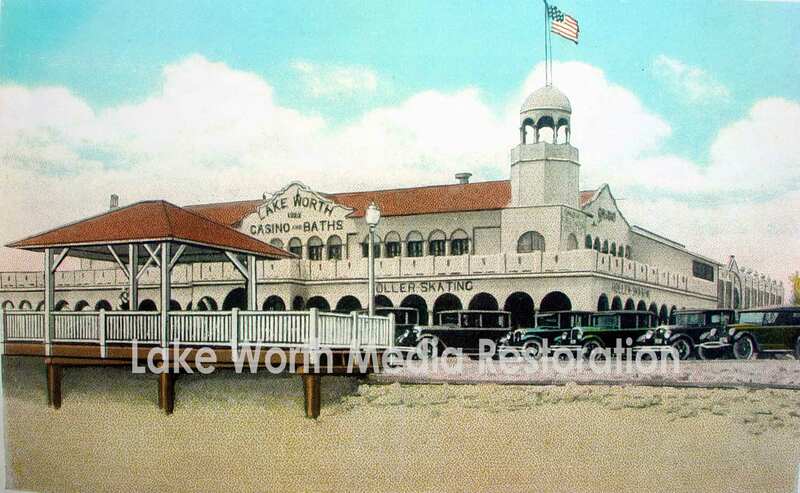 The Casino construction began in August of 1921 and was completed in the spring of 1922. The bond for the construction was for $100,000. 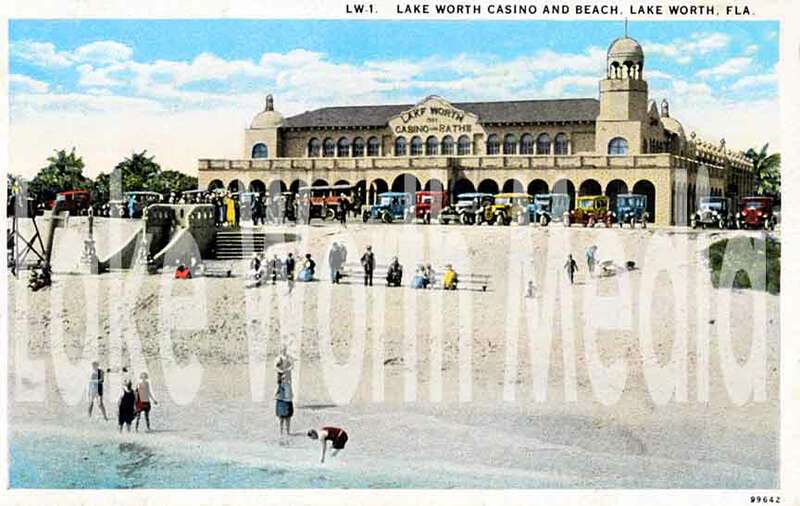 At that time, the beach frontage extended for about 300 feet. 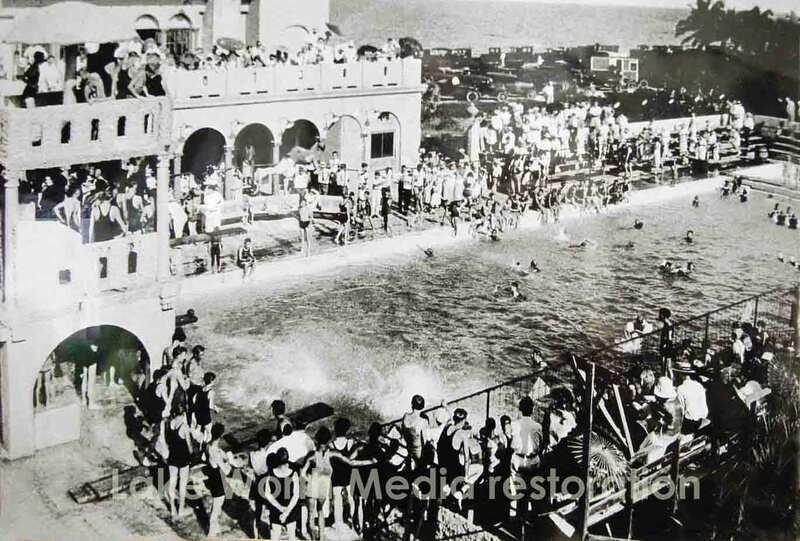 On Independence Day 1941, an extra 1000 feet of beach was acquired by the city. The above photo is likely late twenties (about 1927) since a model A Ford appears in the photo. 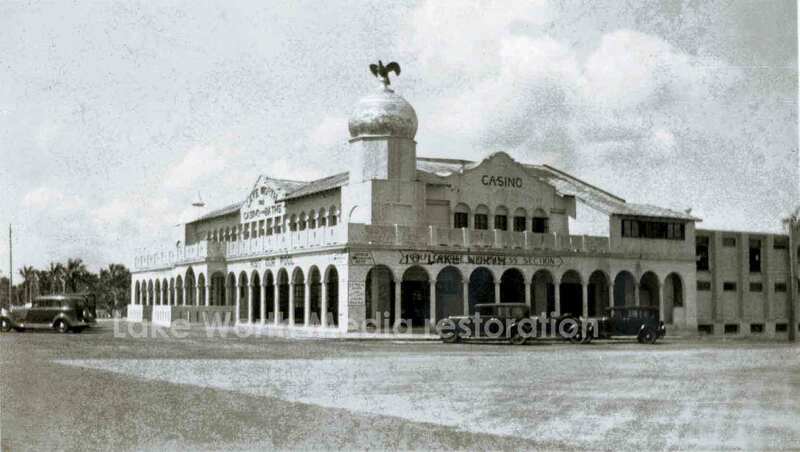 The interior support structure of the original Casino is still intact. 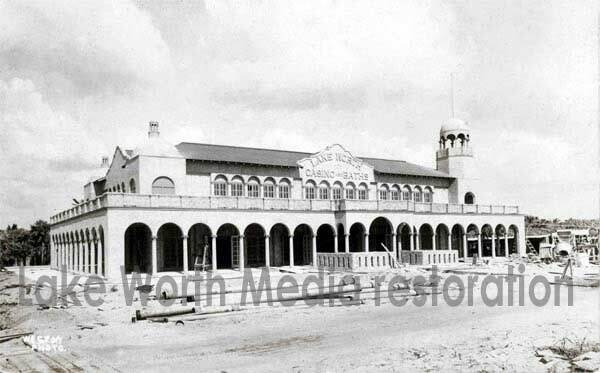 As we shall see, shortly after the hurricane of 1947, the outer arcade and the second story was removed. That was the hurricane that took out a chunk of A1A just south of the Casino prompting the move of A1A from the beach to where it is today. Around 1950 the current building with it's 'dental office look’ was built around the core and a second level added to a portion of it. The city has a long history of allowing this building to deteriorate and failing to arrive at a public consensus on what to do with it. 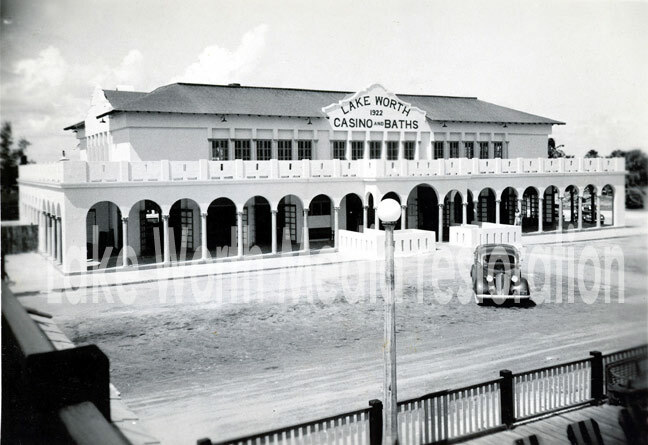 Originally, the Casino was built in an L shaped form around a 40'x100' salt water pool. We have located where the pump house was and have a picture of the pipe used to circulate water in the pool from the ocean. Although there are no remaining floor plans of the Casino, it has been possible to reconstruct a rough sketch of the floor plan which will be presented in the near future. Note the spires... they are the primary clue to dating all subsequent photos of the Casino. In particular, the northeastern spire was lost prior to 1933. The hurricanes of 1926, 1928, and two in the thirties damaged the spires and by the time the forties rolled around, the spires had all disappeared. 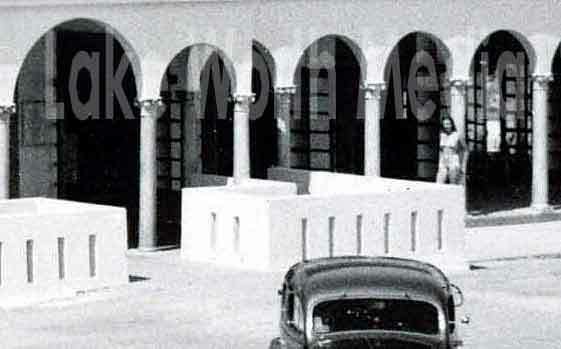 Also, note the arches around the windows; they also hold the key to dating the photos. 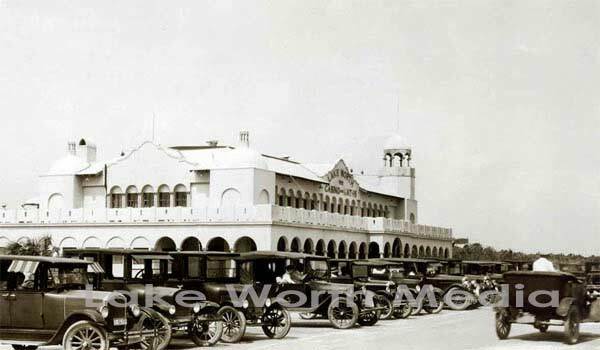 The automobiles shown here include Model A and Model T Fords which also help date the photo. 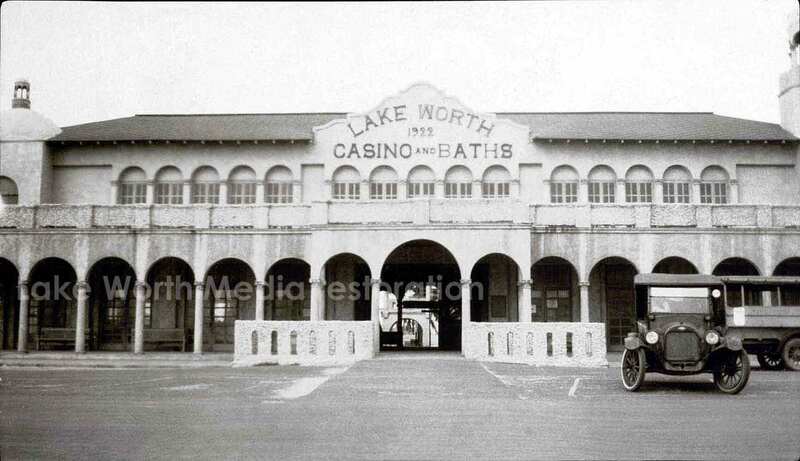 The picture above shows the Casino as its construction was nearing an end in the spring of 1922. The piping in the foreground was installed for use in pumping salt water from the ocean into the pool. 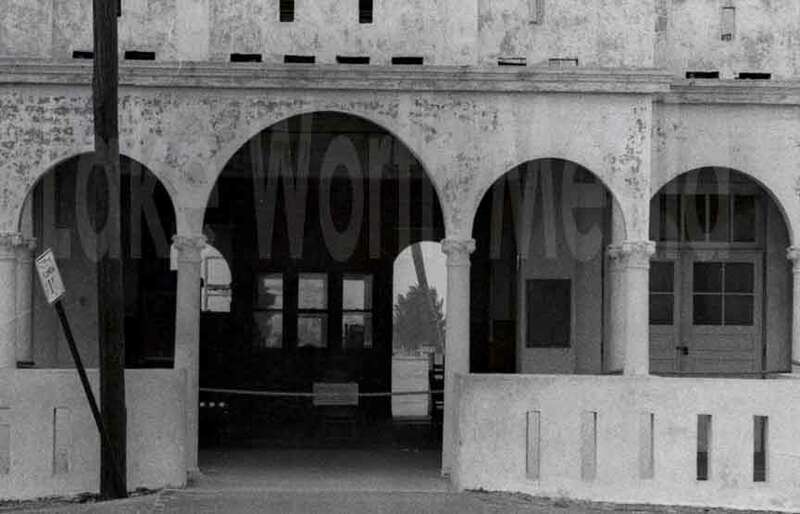 The pump house was located under the boardwalk at one of the covered porches overlooking the ocean. The Moorish architecture was beautifully arranged in stunning proportion to give it a very stylish look. This was truly THE JEWEL OF THE PALM BEACHES. 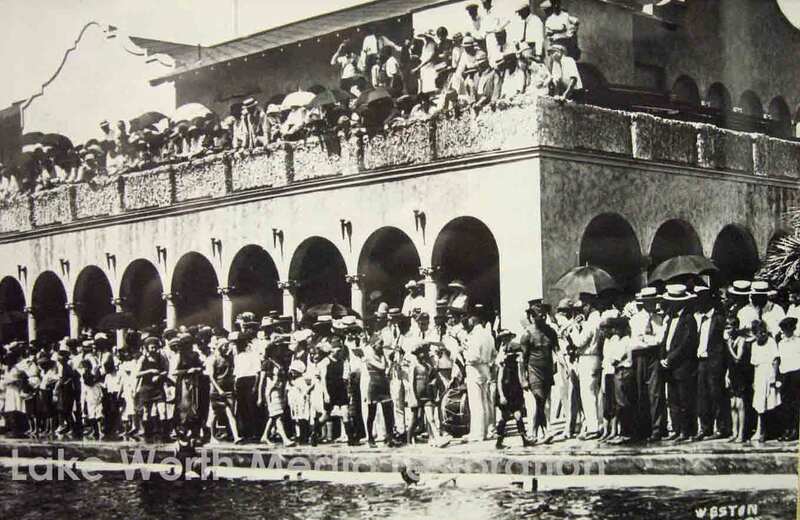 Most likely the northeastern spire was knocked out during the 1928 hurricane which swept through Palm Beach blowing down the world's largest wooden structure at the time - the Royal Poinciana Hotel. 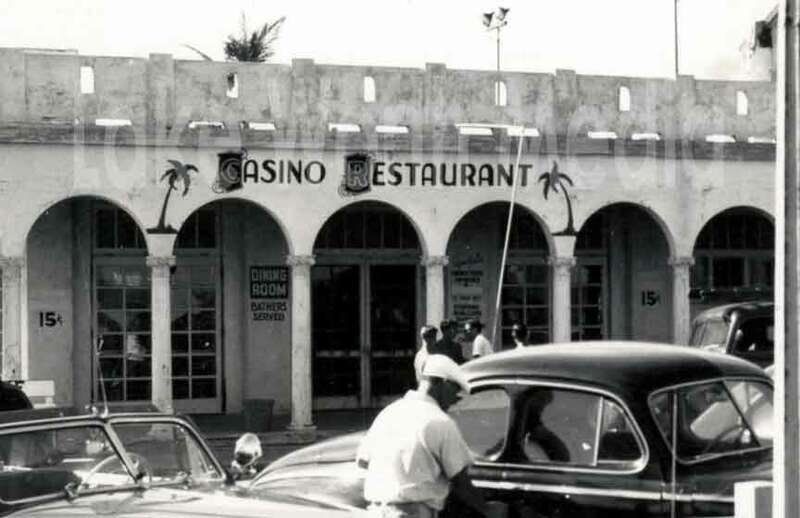 Huge planks of its structure were made of Hart Pine (a favorite of Scorpions) and some of that wood was salvaged and used in structures elsewhere including the building at 611 First Street in WPB now owned by Robert Gottfried. The northeast spire of the Casino was replaced by another spire with a large eagle on it. It didn't make it through the next hurricane or two. The principle weakness of the Casino structure was its roof. It was too light in construction, not aero dynamically compatible with the airflow of the rest of the building and precipitated the immense water damage done to the second floor structure on more than one occasion. 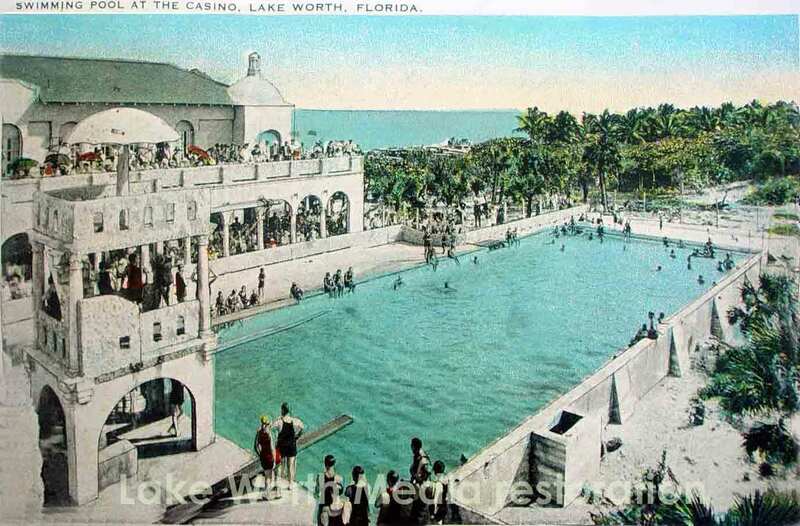 Here's a color enhanced postcard from the early 20's before the boardwalk was constructed. You can see the outlet for the tunnel under A1A which was a saftey feature so that bathers didn't have to cross A1A to get to the beach. This tunnel was recently filled in and the contractor remarked that it was built like a bomb shelter. Early to mid twenties. The original spire is still intact and the center upper level windows have the original arches over them. 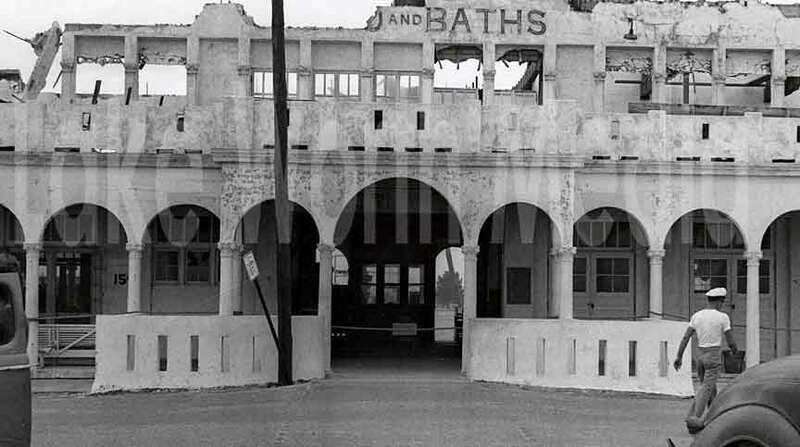 You can see through the main entrance back to the short arched structure that supported the diving boards. This is a color enhanced picture. They actually painted in the colors from a trace of a photo. It shows what a lively community center this was. 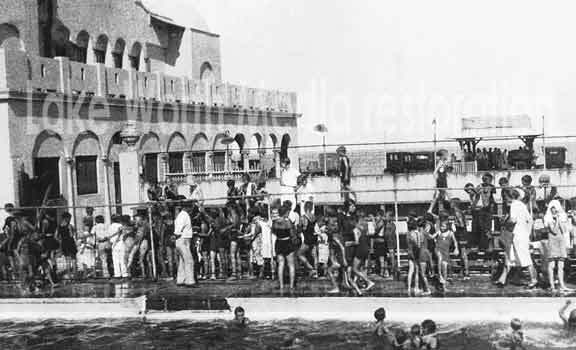 This picture is early 20's and shows the diving tower with its two levels. The boards were either removed or not yet installed at this point. 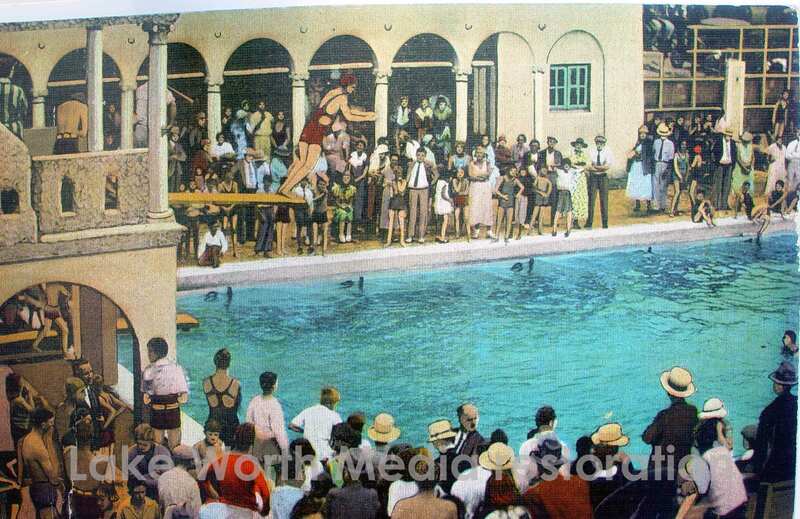 The high dive board was later removed because of the dangerous proximity to the boards beneath it on the first level. This is probably a mid 30's shot. Note the 30's cars and the NE spire with the eagle on it. After the 1928 hurricane, the original spire was replaced with the second spire which is also the one in the picture below. You can see the pipe going out into the water that feeds the swimming pool located behind the Casino. The pump house is the covered area of the boardwalk in line with the pipe. At this point in time, A1A is still along the beach and passes in front of the Casino. This photo is from the early to mid 30's and shows the second NE spire with the eagle on it. Also, the arches over the center windows/French doors on the second floor were squared off for some unknown reason. Architecturally, it didn't make any sense. By the end of the 30's, all the spires had been removed and all the upper level arches had been squared off. The sign in the form of an arrow on the north wall of the Casino says: GOLF COURSE & BUSINESS SECTION and points back across the bridge. By the late 30's and early 40's all the spires had disappeared and for some unknown reason, all the upper level arches over the French doors had been squared off. 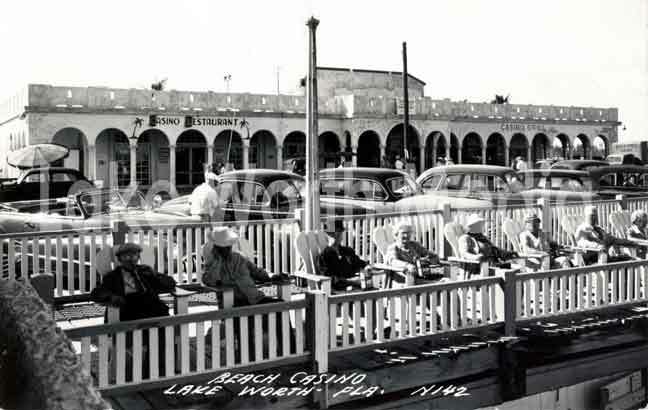 It's not certain exactly when the boardwalk was put into place but likely somewhere before the late 20's. This photo was taken from the upper level of one of the canopied areas of the boardwalk. The photo is a little odd. It may have been taken by some city official. The Casino is wide open, it's well into the day and yet no people are around except for one not so obvious mystery girl. Can anyone identify her? Here she is in a closer look. Just six months before WWII and Pearl Harbor, the people took great pride in this event. Note the spires are all gone. Can anyone identify the people in this shot? 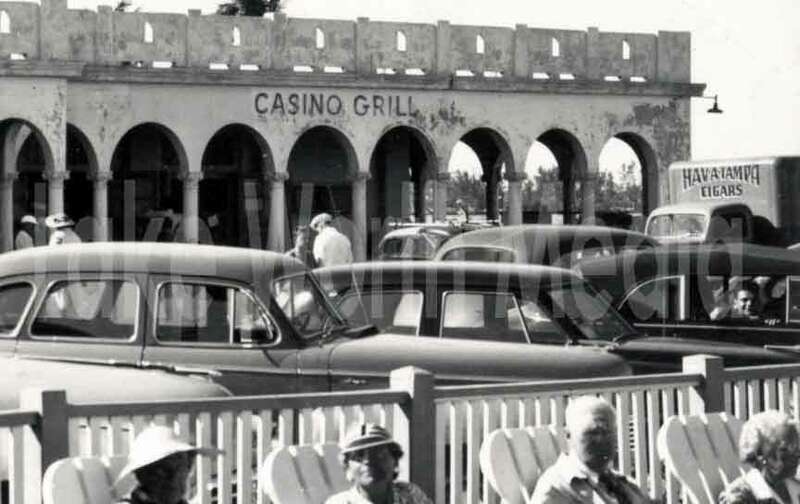 The Casino had already survived two decades of storms which slowly had stripped away its beautiful ornamentation. But in September of 1947, it suffered a fatal blow. The hurricane that went through Fort Lauderdale managed to create the right set of circumstances that finished off the Casino and knocked out a chunk of A1A south of the Casino. 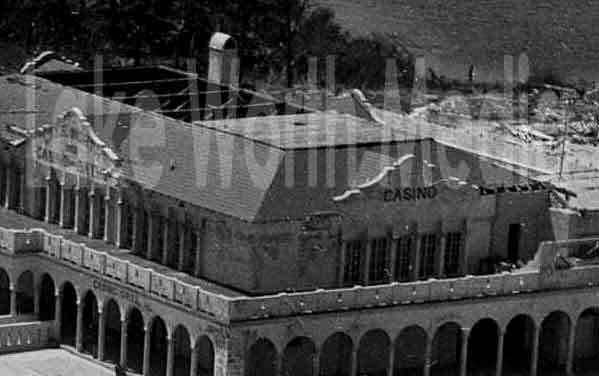 It is the author's theory that a section of the roof actually exploded off the trusses due to the intense pressure inside the Casino added to the low pressure area created directly above the roof. That low pressure area was created by a roof design that acted like an airplane wing which in the high winds, created an intense low pressure area above the flat portion of the roof. The roof construction was too light to withstand the combined pressures. At this point, we don't know what if any storm preparations were made to protect the Casino from the storm. 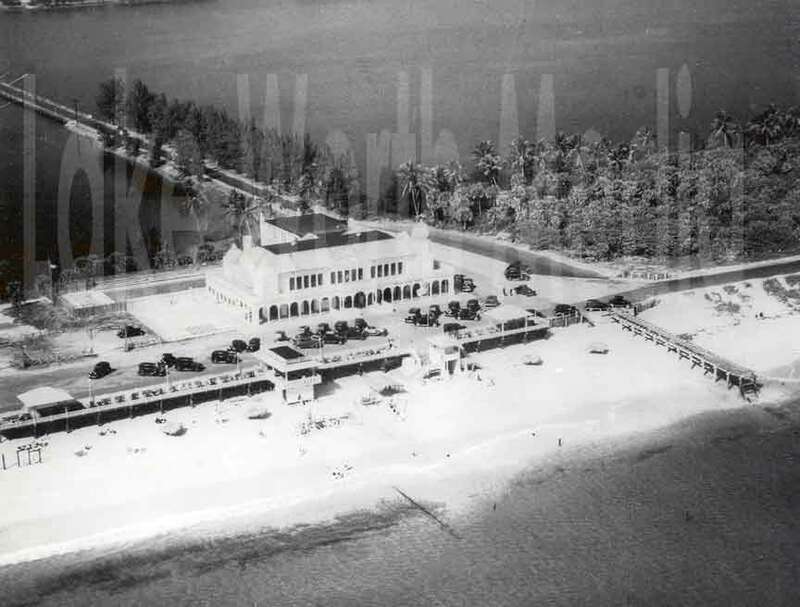 The aerial photo in the collage on the special beach page shows the area of beach adjacent to the boardwalk and retaining wall was unaffected by the hurricane. Miraculously, the boardwalk and chairs survived nearly intact. 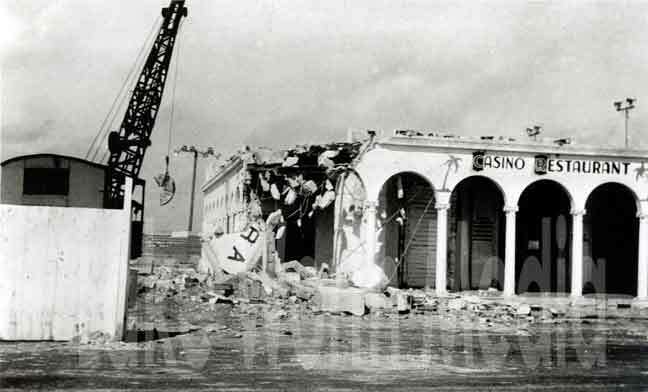 Finally, demolition began in the late 40's and this once proud beautiful building that stood as the Jewel of the Gold Coast had its upper floor removed in the first phase of the demolition. The booth for admission to the pool can still be seen through the main entrance.